Start point is at the bridge over the River Salat at the southern entrance to the town. The original bridge was a main contact point for evaders and their couriers/guides. From the bridge the route passes through housing which leads to a woodland path that takes the walker above the villages of Eycheil, Lacourt, and Alos. The walk continues to the Col de Artique at 880m. Walkers stop at the memorial in memory of 19 year-old Louis Barrau, a passeur who was betrayed, then captured and executed by the Germans. The trail then descends to the Col d’Escots at 725m and climbs again to the hamlet of Aunac 766m, which is the end of day one. 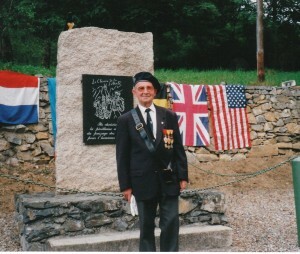 ‘Helper’ Paul Broue in front of the Escape Line Memorial at Aunac. During WW2 Paul’s mother was a safe-house keeper and Paul was a young courier and guide. Because his position became compromised Paul had to escape across the Chemin de la Liberte in 1943. Once in Spain he was arrested and spent his 20th birthday in Lerida Jail; he was later moved to Miranda del Ebro concentration camp. When he was released he joined the Free French Forces to continue the fight for freedom. The walk now changes from the ‘moderate’ walk of Day One to more serious walking. The route is followed to the gite d’etape at Esbints, then continues steeply to the Col de la Core (1395m). 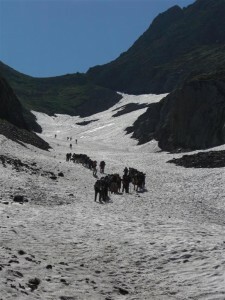 Next, a descent to the road, for approx 330m, until a track leading to the Cabane de Casabede is reached. Onwards to the Col de Soularil (1579m), then a gradual descent to the Cabane de Subera (1499m), which is ‘home’ for the night. Walkers pitch tents and await the arrival of a second group of French walkers. Day Three – Cabane de Subera (1499m) to Refuge Estagnous (2245m). 13km. 8hrs. The climb now becomes much steeper and more difficult. After two hours, walkers arrive at the wreckage of a Halifax Bomber that crashed on 19th July 1945. A plaque has been placed near to the wreckage in memory of the seven crew-members. Following a short ceremony, the climb continues over the Col de Craberous (2382m), and then descends to the Cabane d’Espugue (2110m). After passing the L’Etang de Cruzous, there is a steep climb to the Col de Pecouch (2494m). This is followed by a decent to the Refuge de Estagnous (2245m), where the day’s walk ends. Day Four – Refuge Estagnous(2245m) to Esterri d’Aneu (1200m). 20km. 7hrs. 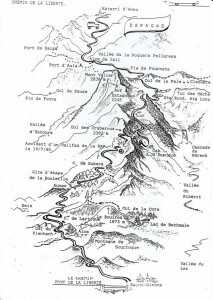 From the refuge (used by evaders during WW2), the route descends to the l’Etang Rond (1929m), then climbs very steeply up to the I’Etang Long (2125m). The Spanish frontier is reached after a further climb to the Col de Claouere (2500m). This is followed by a steep descent into Spain to reach the River Noguera Pallaresa where a track winds along the valley to the village of Alos d’Isil (1200m), and the end of this very difficult route. Within walking distance is the village of Esterri de Aneu, not far from the prison in Sort, which for so many was their final destination. Many walks take place throughout the year, but the commemorative event is always in July. Please Note: The Chemin de la Liberte is over very rugged terrain rising to over 2500m and can be subject to severe weather conditions. The WW2 Escape Lines Memorial Society is not, and cannot be held, responsible for decisions (and any resulting consequences) taken by the guides who lead and organise this event.